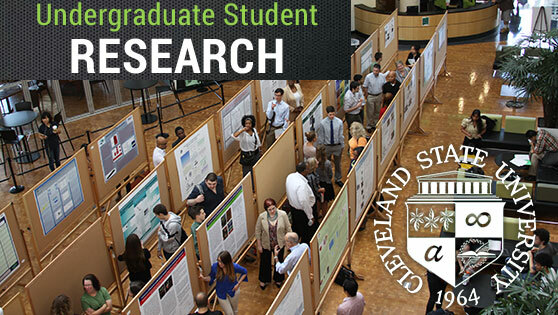 This summer CSU’s Office of Research sponsored 55 research projects from six colleges, involving 77 of our finest undergraduate students.The Fall 2018 Undergraduate Research Poster Session took place on September 6, 2018 from 11am - 2pm in the Student Center Atrium. 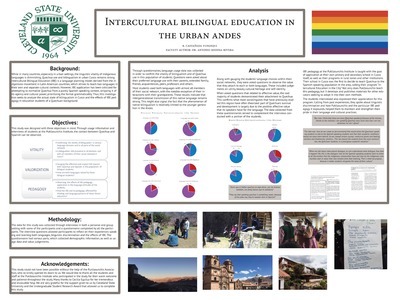 Students, faculty, and staff attended the poster session, which provided students the opportunity to discuss their research with the CSU community. Blood-contacting medical devices, are often used to treat cardiovascular diseases. These implantable medical devices, even if labeled as biocompatible, can cause serious complications in patients. Thrombus formation and infection are the main causes of failure of these devices. In contrast to the healthy endothelium, which actively resists thrombosis, artificial surfaces promote clotting through a complex series of interconnected processes that include protein adsorption, adhesion of platelet, leukocytes and red blood cells, ending with thrombosis. Using a layer-by-layer thin film building strategy to form layers of polyethyleneimine (PEI) and iNOSoxy as NO-releasing coatings allows for assembly of multi-component protein/PEI films. Here, the iNOSoxy enzyme protein used is negatively charged and adsorbed onto the positively charged matrix layer, polyethyleneimine. When discs coated with PEI/iNOSoxy films are exposed to arginine, a source of reducing equivalent, and other required ingredients, nitric oxide is formed and released. We characterize the PEI/iNOSoxy thin films in terms of structure of iNOSoxy within the films as well as the amount of active concentration. Fourier transform infrared (FTIR) spectroscopic analysis characterized structure-activity relationships of these NOScontaining thin films. 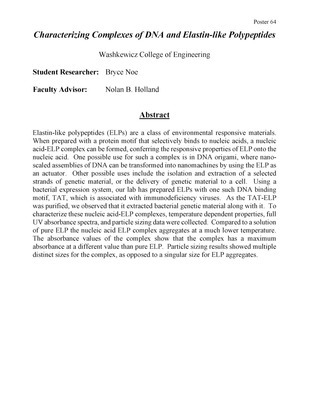 Cyclic voltammetry determined the active catalyst (iNOSoxy) concentration on the modified surfaces, and how this relates to enzymatic activity and resulting NO release fluxes from PEI/NOS-containing thin film. Platelet adhesion assays determined if the amount of platelets adsorbed on the PEI/iNOSoxy films is inversely proportional to the amounts of NO released from coatings. In the United States, breast cancer accounts for one in three cancer diagnoses in women, making it the most common type of cancer in women. One important chemotherapeutic agent used to treat breast cancer is doxorubicin, an anthracycline compound that causes cell death by damaging DNA in addition to producing reactive oxygen species. Previously, the Berdis lab developed an artificial nucleoside analog designated 5-NIdR that improves the efficacy of DNA damaging agents used against brain cancer. This nucleoside works by inhibiting the replication of damaged DNA created by certain chemotherapeutic agents. 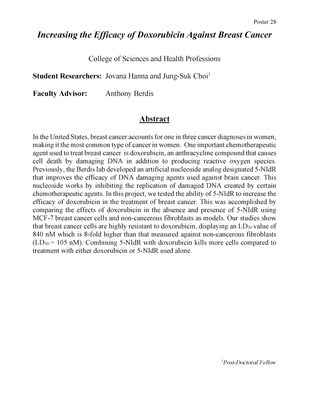 In this project, we tested the ability of 5-NIdR to increase the efficacy of doxorubicin in the treatment of breast cancer. 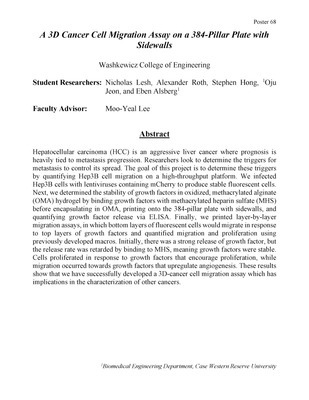 This was accomplished by comparing the effects of doxorubicin in the absence and presence of 5-NIdR using MCF-7 breast cancer cells and non-cancerous fibroblasts as models. Our studies show that breast cancer cells are highly resistant to doxorubicin, displaying an LD50 value of 840 nM which is 8-fold higher than that measured against non-cancerous fibroblasts (LD50 = 105 nM). Combining 5-NIdR with doxorubicin kills more cells compared to treatment with either doxorubicin or 5-NIdR used alone. 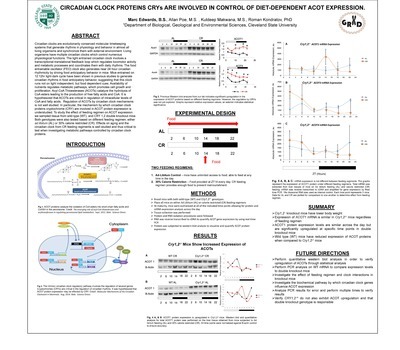 Very-long-chain acyl-CoA dehydrogenase deficiency is the second most common disorder of fatty acid oxidation in the USA, with an incidence of 1:25,000-1:100,000 newborns (Tucci, Floegel, Beermann, Behringer, Spiekerkoetter, 2017, pg. 196). The current dietary therapeutic strategies are designed to avoid long chain fatty acids, instead providing carbohydrates and medium chain triglycerides as an energy source. Despite the controlled and biochemically balanced diet, it has a limited success in treatment of clinical symptoms and metabolic decompensations in VLCAD affected individuals. 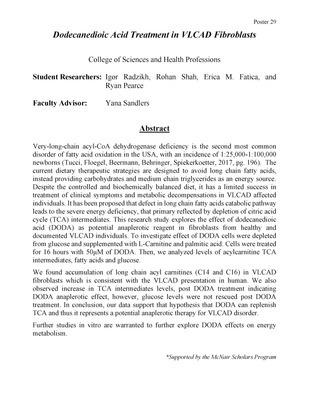 It has been proposed that defect in long chain fatty acids catabolic pathway leads to the severe energy deficiency, that primary reflected by depletion of citric acid cycle (TCA) intermediates. This research study explores the effect of dodecanedioic acid (DODA) as potential anaplerotic reagent in fibroblasts from healthy and documented VLCAD individuals. 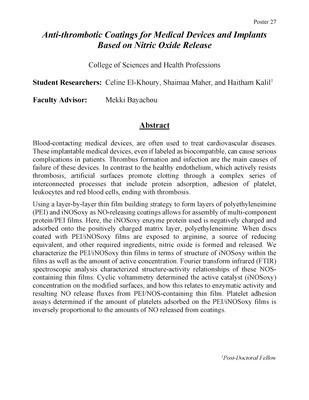 To investigate effect of DODA cells were depleted from glucose and supplemented with L-Carnitine and palmitic acid. Cells were treated for 16 hours with 50μM of DODA. 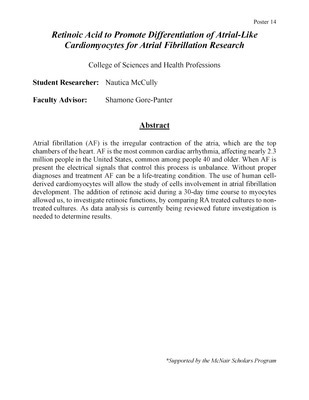 Then, we analyzed levels of acylcarnitine TCA intermediates, fatty acids and glucose. We found accumulation of long chain acyl carnitines (C14 and C16) in VLCAD fibroblasts which is consistent with the VLCAD presentation in human. We also observed increase in TCA intermediates levels, post DODA treatment indicating DODA anaplerotic effect, however, glucose levels were not rescued post DODA treatment. In conclusion, our data support that hypothesis that DODA can replenish TCA and thus it represents a potential anaplerotic therapy for VLCAD disorder. 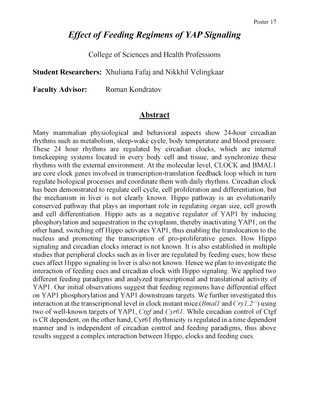 Further studies in vitro are warranted to further explore DODA effects on energy metabolism. 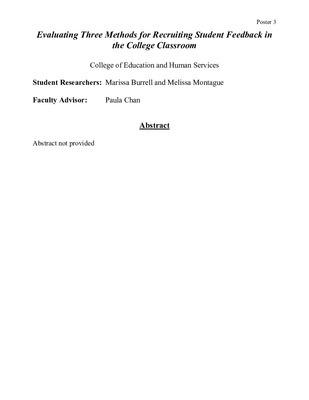 We have developed a class of novel tubulin inhibitors based on NSC751382 (Figure 1), Benzo[1,3]dioxole-5- carboxylic acid [3-(2,5-dimethyl- benzyloxy)-4- (methanesulfonyl-methyl-amino)-phenyl] -amide, as the lead compound. 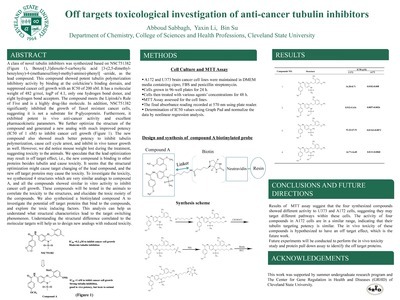 This compound showed potent tubulin polymerization inhibitory activity by binding at the colchicine’s binding domain, and suppressed cancer cell growth with an IC50 of 200nM. It has molecular weight of 482, logP of 4.1, only one hydrogen bond donor, and eight hydrogen bond acceptors. The compound meets the Lipinski's Rule of Five and is a highly drug-like molecule. 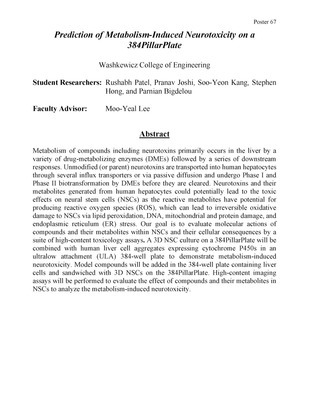 In addition, NSC751382 significantly inhibited the growth of Taxol resistant cancer cells, suggesting it is not a substrate for P-glycoprotein. Furthermore, it exhibited potent in vivo anti-cancer activity and excellent pharmacokinetic parameters. We further optimize the structure of the compound and generated a new analog with much improved potency (IC50 of 1nM) to inhibit cancer cell growth (Figure 1). The new compound also showed much better potency to inhibit tubulin polymerization, cause cell cycle arrest, and inhibit in vivo tumor growth as well. However, we did notice mouse weight lost during the treatment, suggesting toxicity to the animals. 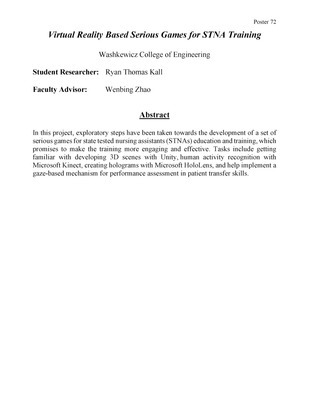 We speculate that the lead optimization may result in off target effect, i.e., the new compound possibly bind to other proteins besides tubulin and cause toxicity. It seems that the structural optimization might cause target changing of the lead compound, and the new off target proteins may cause the toxicity. To investigate the toxicity, we synthesized 6 structure very similar analogs to compound A, and all the compounds showed similar in vitro activity to inhibit cancer cell growth. These compounds will be tested in the animals to correlate the toxicity to the structures, and elucidate the toxic moiety of the compounds. We also synthesized a biotinylated compound A to investigate the potential off target proteins that bind to the compounds, and explore the toxic inducing factors. This analysis can help us understand what structural characteristics lead to the target switching phenomenon. Understanding the structural difference correlated to the molecular targets will help us to design new analogs with reduced toxicity. The exterior of cell surfaces express a dense layer of glycans which are often terminated by sialic acid (SA). SA is an acidic monosaccharide whose presence is found on the terminal ends of glycans of either glycoproteins or glycolipids. Due to its hydrophilic and electronegative nature, SA is often involved in both physiological and pathological processes, such as in regulating cellular interactions with ligands, microbes and neighboring cells. In addition to these functions, SA is also implicated in controlling cellular activation, differentiation, transformation and migration. Cell surface glycometabolic engineering provides a useful tool to remodel cell surface SA. In this study, a di-methyl amide derivative of SA, which lacks anionic character, was designed and synthesized for modulation of cell surface SA application. 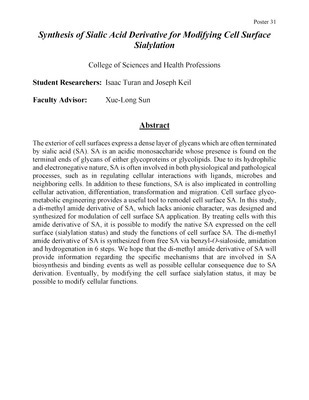 By treating cells with this amide derivative of SA, it is possible to modify the native SA expressed on the cell surface (sialylation status) and study the functions of cell surface SA. The di-methyl amide derivative of SA is synthesized from free SA via benzyl-O-sialoside, amidation and hydrogenation in 6 steps. 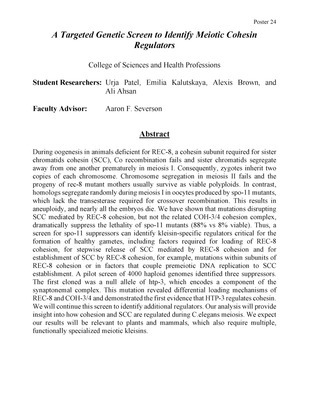 We hope that the di-methyl amide derivative of SA will provide information regarding the specific mechanisms that are involved in SA biosynthesis and binding events as well as possible cellular consequence due to SA derivation. 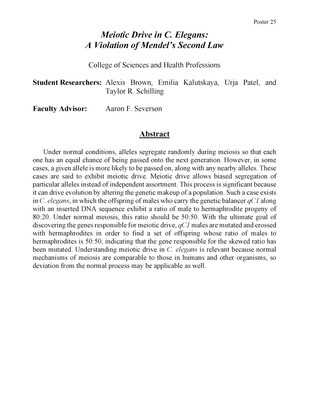 Eventually, by modifying the cell surface sialylation status, it may be possible to modify cellular functions. Transmembrane and coiled-coil domains 1 (TMCO1) is a protein of 22 KDa highly conserved in amino acid sequence among mammalian species and functions as an endoplasmic reticulum (ER) Ca2+load-activated Ca2+channel. Homozygous frameshift mutation in TMCO1 causes distinctive craniofacial dysmorphism, skeletal anomalies, and mental retardation. However, its physiological functions are largely unknown. In this study, we found that TMCO1 was co-localized with microtubules as determined by immunohistostaining and a co-sedimentation assay. Interestingly, TMCO1 was highly expressed in the invasive front of high grade lung cancer and metastatic cancer cells of clinical specimens. 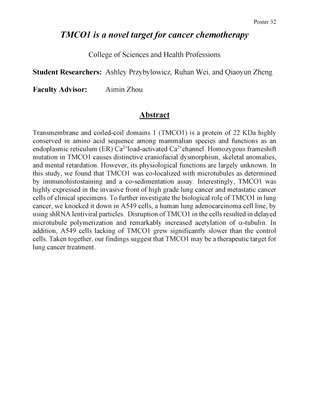 To further investigate the biological role of TMCO1 in lung cancer, we knocked it down in A549 cells, a human lung adenocarcinoma cell line, by using shRNA lentiviral particles. Disruption of TMCO1 in the cells resulted in delayed microtubule polymerization and remarkably increased acetylation of -tubulin. In addition, A549 cells lacking of TMCO1 grew significantly slower than the control cells. Taken together, our findings suggest that TMCO1 may be a therapeutic target for lung cancer treatment. Peer Quizzing: Are Two Heads Really Better Than One? 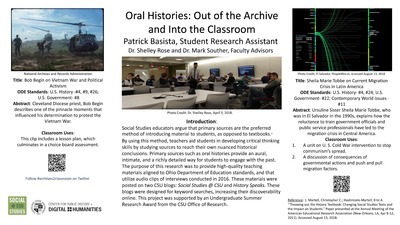 Instructors are often plagued with a difficult opened ended question; what measures can be implemented during class that will maximize students’ academic benefit? 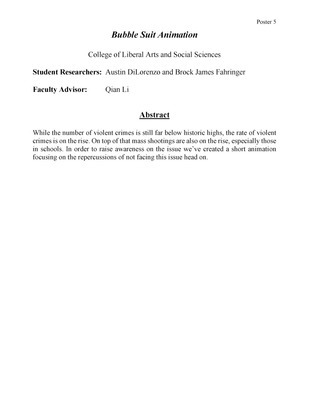 During this research project, the impact of frequent peer quizzing in introductory college level physics courses on subsequent learning assessments, such as midterms and percent gain, are examined. A peer quiz is initially administered to a student individually and graded but not returned to the students until they are given the opportunity to revisit the same quiz question with a partner. 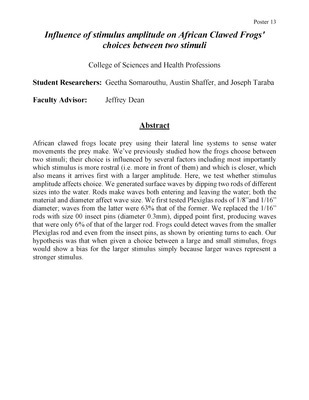 Two physics instructors’ student data is included in the data set, which is comprised of Introductory Calculus Based Mechanics (“PHY 241”) and Introductory Calculus Based Electricity and Magnetism (“PHY 242”) classes that either have peer, individual or no quizzes. 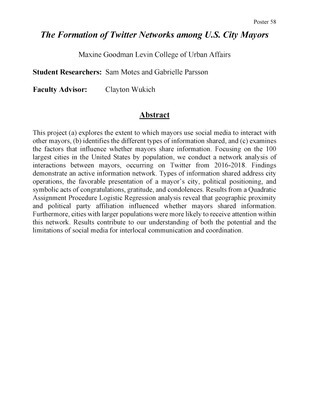 The results of this project show that peer learning quiz classes yield a higher correlation between various assessments than individual quiz classes. This suggests that peer quizzes are more effecting in teaching college level introductory physics courses than individual quizzes. 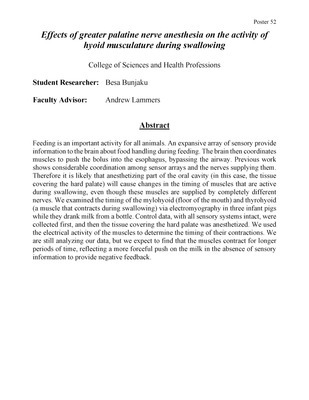 These results hold true when top ranking pretest scorers are removed from the data sets, thus indicating that peer quizzes are beneficial to both students that do and do not have prior understanding of the course material. Microgels are thermoresponsive polymeric nanoparticles whose size in aqueous solution is dependent on temperature. 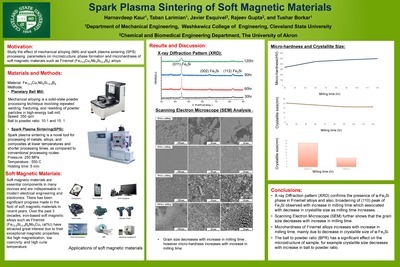 The microgels were studied using both dynamic light scattering (DLS) and scanning electron microscopy (SEM) to better understand the nanoparticles dynamics. 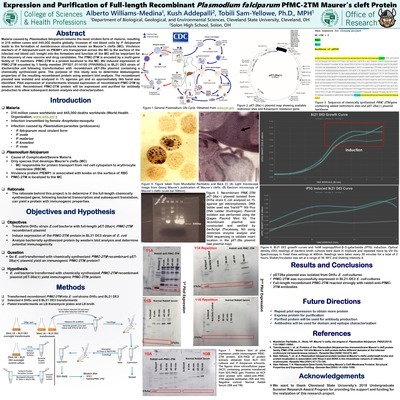 The first part of the study focused on developing a controlled preparation procedure which would generate reproducible SEM images on a wet sample. The ionic liquid was mixed with a dilute solution of microgels and water was dried using nitrogen gas. This technique allowed a large volume of microgels to easily transition from their natural water solvent to a low vapor pressure ionic solvent. 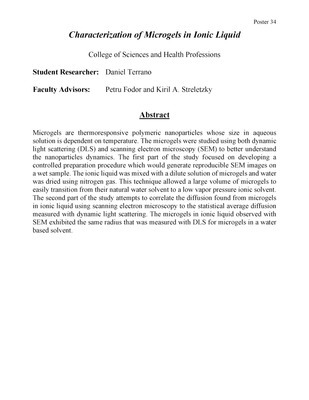 The second part of the study attempts to correlate the diffusion found from microgels in ionic liquid using scanning electron microscopy to the statistical average diffusion measured with dynamic light scattering. 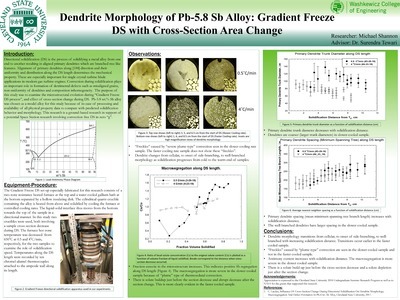 The microgels in ionic liquid observed with SEM exhibited the same radius that was measured with DLS for microgels in a water based solvent. Muons are important due to the abundance of them on earth. Muons that are on earth originate from the Sun and enter Earth’s atmosphere as decaying cosmic rays. Muons are somewhat unstable, with a lifespan of roughly 2.2 microseconds. Muons decay into electrons and two types of neutrinos. Since Muons travel near the speed of light they can still go thousands of meters into the Earth’s crust before stopping. Muons account for most of the cosmic radiation at sea level. Muons are harmless to humans. 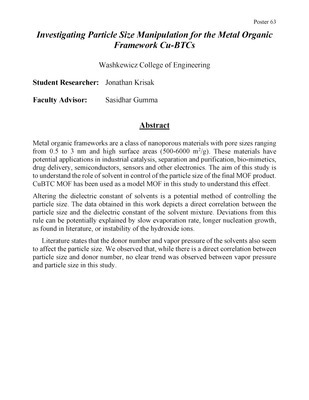 In this study, we built detectors and measured muon counts at different elevations. 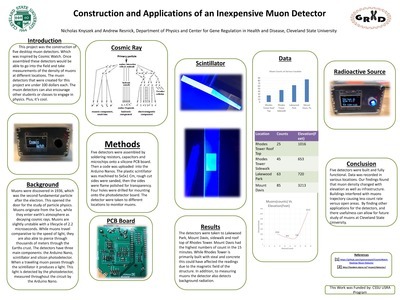 This research project was inspired by Cosmic Watch, which was funded by MIT in 2016. These detectors are inexpensive to make compared to previous models. There are three main components of the detector which are the Arduino Nano, scintillator and photodector. We find that the higher in altitude the higher the count rate is on the detector. Theses detectors can encourage future students and classes at Cleveland State University to pursue physics. 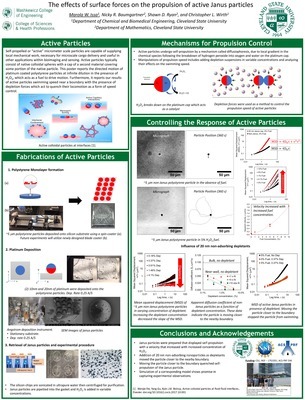 Microgels are nanoparticles suspended in solution and comprised of crosslinked polymer chains. Due to the amphiphilic property of the parent polymer, microgels exhibit a reversible volume phase transition. The standard behavior of these microgels is to deswell from a large to small size with an increase in temperature. 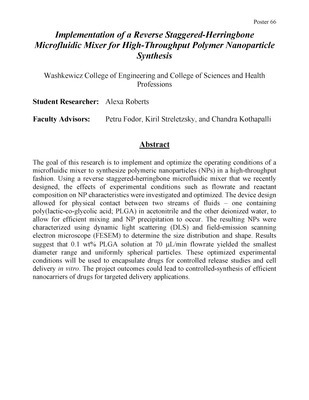 Microgels in this study were synthesized by crosslinking hydroxypropylcellulose (HPC) in a surfactant solution. The amount of crosslinker used for synthesis was varied by a factor of a hundred. Using dynamic light scattering, microgels were characterized at various temperatures and scattering angles to determine the particles’ hydrodynamic radius (Rh) and dynamics both in the swollen and deswollen states. 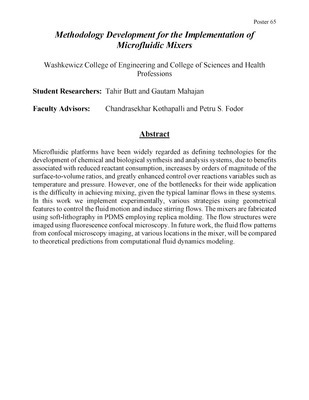 It was recently shown that for low crosslinker concentrations, microgels exhibit standard behavior, with a decrease in radii as crosslinker concentration increases. Above a certain concentration, the behavior switches from standard behavior to microgel growth with temperature increase. Using a new polymer stock, both behaviors were reproduced using the same synthesis procedure; however, the point at which microgel deswelling switches to growth appeared to shift towards a lower crosslinker concentration. 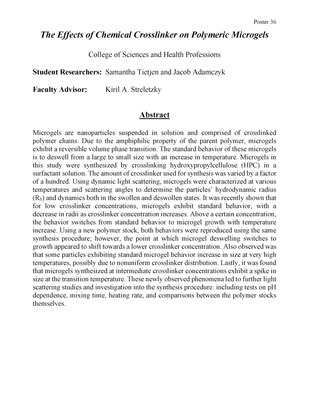 Also observed was that some particles exhibiting standard microgel behavior increase in size at very high temperatures, possibly due to nonuniform crosslinker distribution. Lastly, it was found that microgels synthesized at intermediate crosslinker concentrations exhibit a spike in size at the transition temperature. 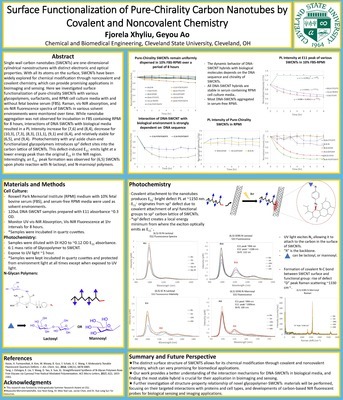 These newly observed phenomena led to further light scattering studies and investigation into the synthesis procedure: including tests on pH dependence, mixing time, heating rate, and comparisons between the polymer stocks themselves. Microgels are polymer-based particles which are able to change size and shape during volume phase transition in response to external stimuli. We have investigated microgels which respond to changes in temperature for eventual use in drug-delivery systems on the nano to micro scale. 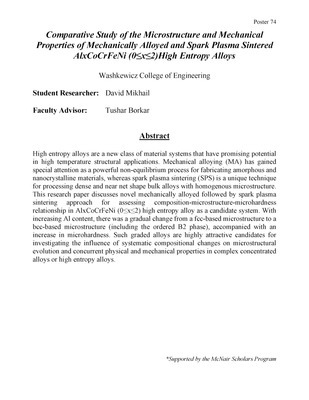 Light scattering data on Hydroxypropylcellulose (HPC) microgels has been analyzed to determine microgel parameters such as radii, molecular weight, and polydispersity at various temperatures. 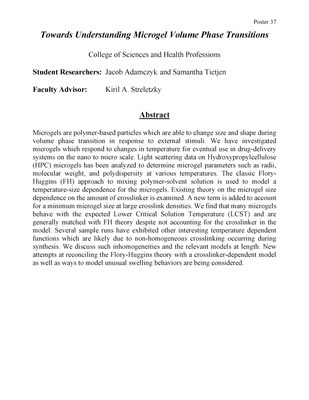 The classic Flory- Huggins (FH) approach to mixing polymer-solvent solution is used to model a temperature-size dependence for the microgels. Existing theory on the microgel size dependence on the amount of crosslinker is examined. A new term is added to account for a minimum microgel size at large crosslink densities. We find that many microgels behave with the expected Lower Critical Solution Temperature (LCST) and are generally matched with FH theory despite not accounting for the crosslinker in the model. 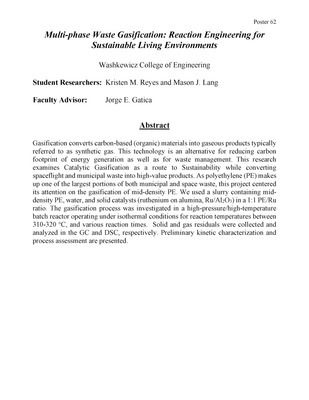 Several sample runs have exhibited other interesting temperature dependent functions which are likely due to non-homogeneous crosslinking occurring during synthesis. We discuss such inhomogeneities and the relevant models at length. New attempts at reconciling the Flory-Huggins theory with a crosslinker-dependent model as well as ways to model unusual swelling behaviors are being considered. Clouds are a poorly understood phenomenon that have a significant impact on climate and day-to-day weather. This research aims to measure cloud size distributions for shallow cumulus clouds from observational data. Clouds are sampled via a ceilometer, which indicates both the presence of cloudy air and the base height of the respective cloud. When combining this data with the recorded horizontal wind velocity, we can infer a cloud transect size distribution. After sufficient sampling, we can use an algorithm to deduce an approximate cloud area distribution for the specified time range and cloud field. Once the cloud size distributions are obtained, they are compared to cloud size distributions acquired through Large-Eddy simulations. The data used is sourced from Atmospheric Radiation Measurement (ARM) facilities in the Southern Great Plains (SGP) region, which are established by the Department of Energy (DOE). The convective boundary layer (CBL) is the lowest part of the atmosphere. The turbulent motions in the CBL are important for redistributing trace gases, particles, heat, and momentum between the surface and the free troposphere thus it is important that this process is properly represented in numerical models that attempts to simulate the atmosphere. This study is trying to characterize the water vapor structure in the quasi-stationary CBL, using statistical way to build the turbulent model and uses a high resolution model: Large Eddy Simulation (LES) to investigate the adequacy of the model. We found that the water vapor flux at the entrainment zone could be predicted by the variance of water vapor. 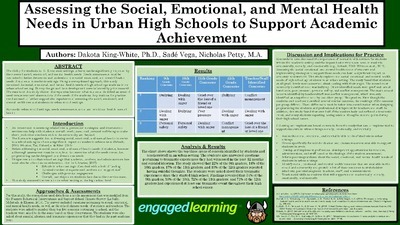 We are using the data from LES to development this relationship further. The cloud cover provided by boundary layer cumulus clouds is one of the greatest uncertainties in climate and weather prediction models. It is difficult with current technology to cheaply and accurately collect cloud cover data. The TSI (Total Sky Imager) provides a hemispheric field of view in order to maximize the area it can see. The farther away from the center of the image, the more angled the view of the the cloud is. Therefore, more of the side of the cloud is captured in addition to the cloud base. Machine learning is well suited to seeing through this bias. In this study, LES (Large Eddy Simulation) generated fields are used to train a convolutional neural network based on DeepLab to use semantic segmentation distinguish between the cloud side and base. Clouds play a crucial role in determining the weather on local and global scales, yet their complexity accounts for some of the largest uncertainties in weather forecasts and climate models. Environmental air mixing or being drawn into a current, called entrainment, is one source to blame for this complexity. When air entrains into a cloud evaporation of in-cloud condensates increase and temperatures in the cloud drop, reducing buoyancy. The overall effect of entrainment inhibits a cloud’s development, and usually results in the dissipation of a cloud. 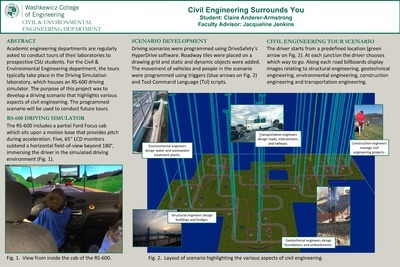 With the use of data generated from a high-resolution computer model known as Large Eddy Simulations, this project studies the entrainment in shallow convective cumulus clouds. 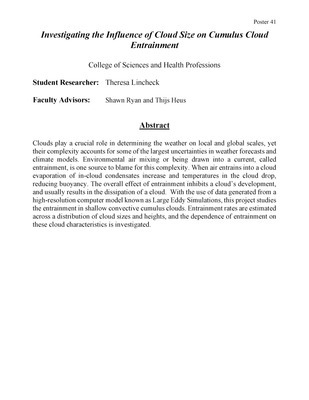 Entrainment rates are estimated across a distribution of cloud sizes and heights, and the dependence of entrainment on these cloud characteristics is investigated. The relationship a teenage girl and her mother hold is vital in the outcome and the decisions the teen makes. This relationship is influenced by many different things including communication patterns the mother and teen have. The aim of this study is to look at the way the two communicate throughout the teen years of the daughter to see if there is an association with whether or not the teen becomes pregnant. Teen pregnancy has been an obstacle many girls have had to face during their adolescent years. This is due to the numerous teenagers that are sexually active during this time and other factors that play a role leading up to teen pregnancy. I will be asking about different aspects within the relationship the teen and her mother held as well as any changes the teen would have liked to see within this relationship. 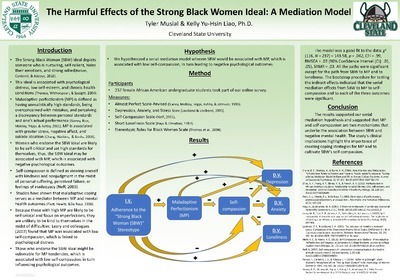 With my study, the sample will include women between the ages of 18-35. There will be an online survey they will answer that will inquire about the individual participant’s thoughts and feelings about the relationship she had with her mother. I will also be looking for other factors that may have influenced the outcome of teen pregnancy, if this was the case, for each participant. The goal is to understand in what ways teen pregnancy can be prevented and if one of those ways can start with the relationship between the teen and their mother. With a striking rise in drug related deaths over the past few years, researchers have looked towards improving prevention methods as a way to not only react to substance abuse with treatment, but learn to better prevent individuals from following these risk taking behaviors. Adolescents specifically are prone to risk taking behaviors such as substance use as they navigate through the challenges of adolescence and transitioning into their identities. Therefore, research in understanding how and why youth decide to get involved in substances is important for creating stronger prevention. 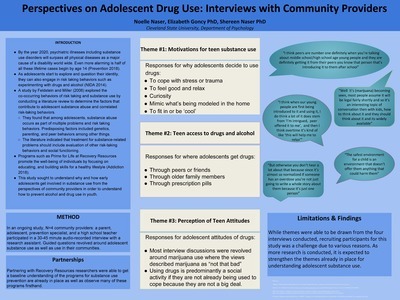 Using qualitative data obtained from semi-structured interviews with community providers (N=4), the current study identifies themes revolved around adolescent substance use as well as use in their communities. Along with information gathered from the interviews, partnerships were created with a local community center, Recovery Resources, in order to learn and observe the prevention programs already in place. 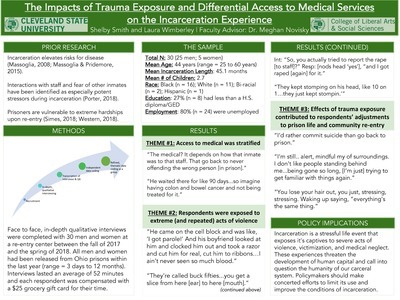 Themes revealed from the interviews showed the following factors: (1) motivation for teen substance use such as a coping mechanism, (2) where teens get access to substances such as from peers, and (3) the perception of teen attitudes towards substances such as drugs not being a big deal. Personal quotes from these interviews highlight the themes being drawn as well as give first-hand thoughts to the big picture of substance use in society. 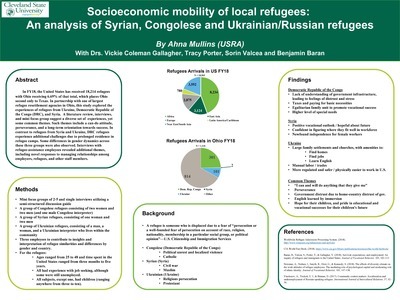 Limitations included recruiting participants for the study and therefore further research needs to be conducted to verify the themes being drawn. Physical rehabilitation is an important part of a patient’s recovery after surgery. Physical therapists are crucial to the success of that patient’s healing process. Physical rehabilitation can determine how quickly the patient’s healing progresses. It is difficult to determine how long a person will be in rehab and every patient has different expectations of how long their recovery will take. In this study, I explored how a patient’s perception of time affects the estimated versus actual recovery time post-surgery. The participants were patients admitted to the inpatient rehab at Mercy Regional Medical Center in Lorain, Ohio. Each patient was assessed on their perception of time as well as their expected recovery time compared to their actual recovery time. 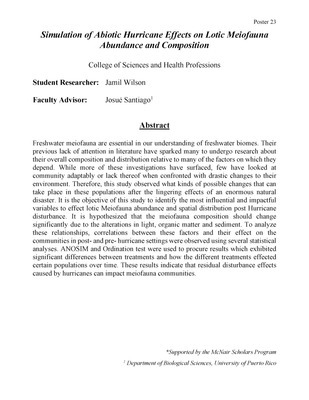 All patients were surveyed and placed on the Zimbardo Time Perspective Inventory subscale. I was seeking to determine if there is a strong relationship between a patient’s perception of time and how long they expect their recovery to take. 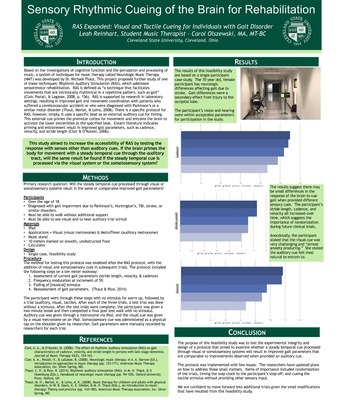 As a result of this study, it was found that there was a negative correlation between a patient’s perception of time and how long they expected their recovery to take. 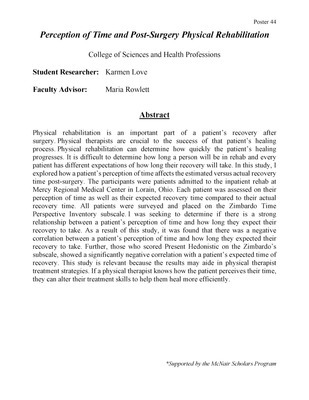 Further, those who scored Present Hedonistic on the Zimbardo’s subscale, showed a significantly negative correlation with a patient’s expected time of recovery. 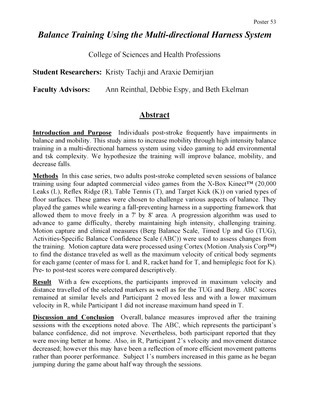 This study is relevant because the results may aide in physical therapist treatment strategies. If a physical therapist knows how the patient perceives their time, they can alter their treatment skills to help them heal more efficiently. 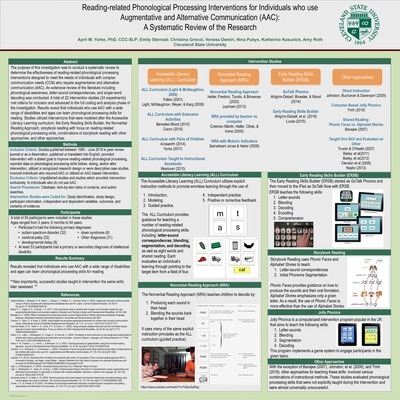 Some models of word identification hypothesize that the word recognition system includes units responsive to bigrams (letter pairs). Grainger, Mathot, and Vitu (2014) and Palinski (2016) found that target-flanking bigrams consisting of letters adjacent in targets (e.g., OG FROG FR) affect decisions about whether letter strings are words: Bigram-letter order, but not proximity of bigram letters to their locations in the targets, affected performance. (Average performance was better with FR FROG OG and OG FROG FR than with RF FROG GO and GO FROG RF, but no different with FR FROG OG and RF FROG GO than with OG FROG FR and GO FROG RF.) In a second experiment, Palinski (2016) included nonadjacent-letter flanking bigrams (e.g., FO FROG RG). 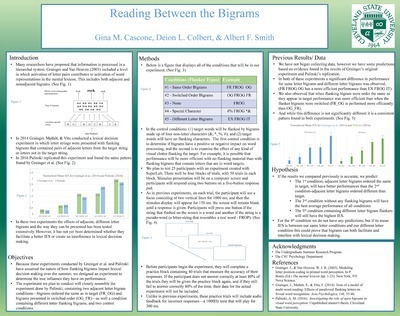 For adjacent-letter bigrams she found, as did Araya, Russo, and Smith (2017) in an exact replication, significant effects of both letter order and letter proximity. To investigate whether performance with adjacent-letter bigrams depends on the presence of non-adjacent-letter bigrams, we presented these in different blocks of trials. The results were consistent with those of Palinski and of Araya et al. 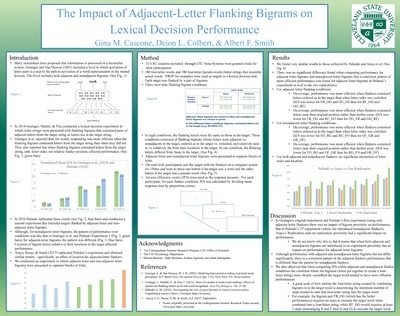 Lexical decision performance with adjacent-letter flanking bigrams appears to depend on the presence of non-adjacent letter bigrams in the experimental context. In lexical decision experiments in which target strings were flanked by pairs of bigrams, Grainger, Mathot, and Vitu (2014) and Palinski (2016) found, for words, better performance when flanking bigrams contained target-string letters (e.g., FR FROG OG; OG FROG FR; RF FROG GO; GO FROG RF) than when they did not (e.g., EX FROG IT); better performance when flanking bigrams contained letters ordered as in the target (e.g., FR FROG OG; OG FROG FR) than switched (e.g., RF FROG GO; GO FROG RF); and no effect on performance of proximity of flanking letters to their locations in the targets. We plan (and have programmed) an experiment to investigate (1) whether the effects of whether flanking bigrams contain target-string letters are facilitative, interfering, or both; (2) the general effect of flanking characters; and (3) whether proximity of flanking letters to their locations in targets affects performance when flanking letters are ordered as in targets. This experiment will include three previously used display conditions (e.g., FR FROG OG; OG FROG FR; EX FROG IT) and two control conditions—one in which no characters will flank targets and one in which targets will be flanked by special character bigrams (e.g., #* FROG %&). For the past six years, our laboratory has conducted experiments programmed in Superlab, a software package designed exclusively for psychological experiments. Although Superlab has some attractive features, it also has some severe limitations. 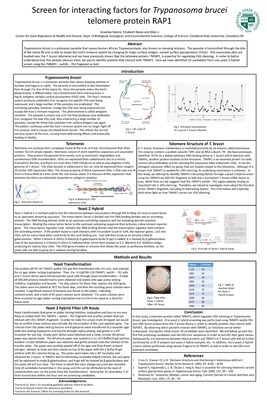 For example, Superlab cannot read files, meaning that for an experiment in which each participant has a unique stimulus list, a unique program has to be assembled for each participant. 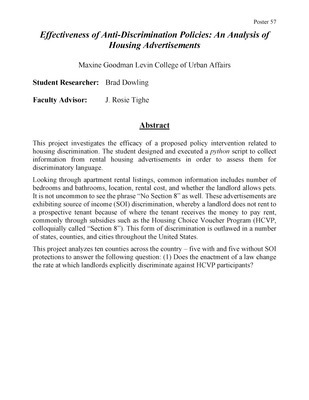 For an experiment in which each participant has a unique order of conditions, a unique program with the conditions in that order has to be assembled for each participant. Preparing numerous unique programs provides numerous opportunities for errors. 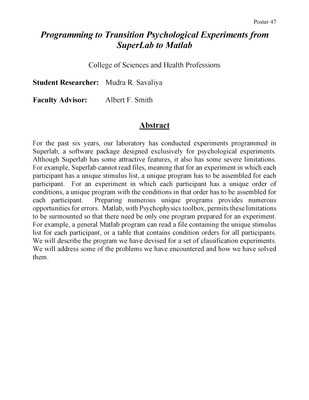 Matlab, with Psychophysics toolbox, permits these limitations to be surmounted so that there need be only one program prepared for an experiment. For example, a general Matlab program can read a file containing the unique stimulus list for each participant, or a table that contains condition orders for all participants. We will describe the program we have devised for a set of classification experiments. We will address some of the problems we have encountered and how we have solved them. Falling can be a life-threatening event, especially for older adults. Clinicians use balance training to reduce fall incidents in at-risk individuals. There are various forms of balance training, and they often employ a harness system to prevent patient injury. Current harness systems are capable of supporting a percentage of an individual’s body weight and catching people in the midst of falling, and some may even perform both of these functions. However, injury can still be incurred from using a harness, particularly among the frail elderly. This lab has developed a new, controlled harness system that will be able to perform all the functions of the body-weight support and fall-arresting harness systems, with the additional feature of decelerating the rate of a person’s fall. This harness will be tested in a pilot study among adults aged 55 years or older with balance impairments. The subjects will experience slip training progressions with this new harness system and their response will be tracked using a motion analysis system called CORTEX. Results from tests completed with this harness system will be analyzed to understand the role of the motorized harness in a holistic balance training regimen. 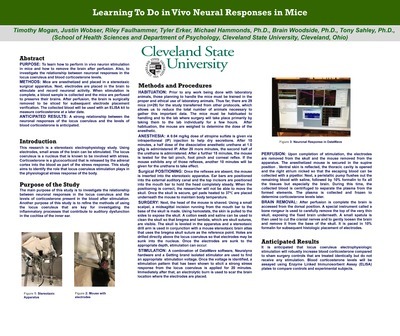 Timothy Mogan, Tyler Erker, Riley Faulhammer and Justin Wobser were the target students for this stereotaxic neurosurgery and electrophysiology lab experience. They are Pre-Nursing, Pre-Neuroscience (Pyschology) or Pre-Med majors. This richly educational and hands-on investigation significantly enhanced their confidence and experience in RODENT HANDLING, ANESTHESIA, ELECTROPHSYIOLOGY, PERFUSION, BRAIN REMOVAL and GENERAL LAB SKILLS. 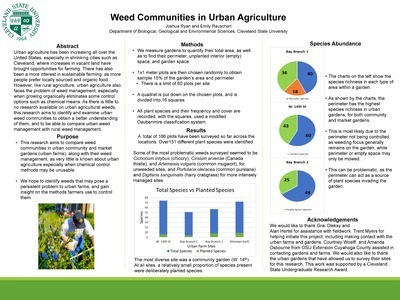 An animal use protocol was created for the project under the guidance of the Mentors and the students followed it competently. Students completed CITI online animal research training and animal handling training was provided by Lou Turchyn, DVM. Animals for the research were generously donated by Dr. Turchyn and other animal investigators at CSU so that this investigation did not require any additional research animals. 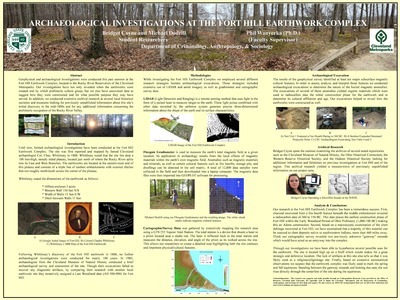 A poster presentation of the first stages of the study covering background and significance, data collection methods and specimen preservation was academically instructive. 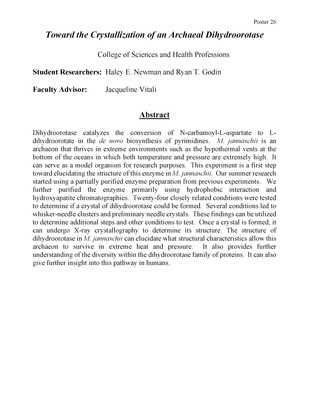 Next, the molecular biology analysis of the specimens is expected to generate a proof of concept for methods necessary to conduct ongoing research in cochlear (inner ear) dysfunction ostensibly caused by dynorphins released during acoustic over-stimulation stress by Drs. Tony Sahley, David Anderson, Michael Hammonds and Karthik Chandu. Case Physical Therapy is the study of patient/client cases to augment a practitioner’s clinical thinking, reasoning, and decision-making skills. 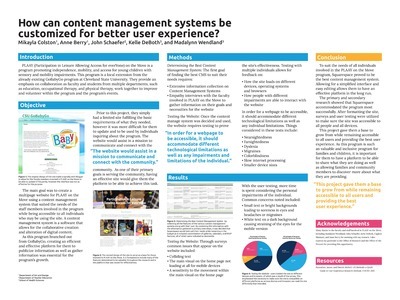 Game-based learning, as part of an academic arcade, can add enjoyment and competition to an otherwise mundane process of acquiring knowledge and understanding and may serve to incentivize the student. 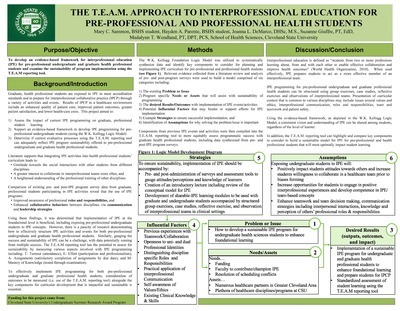 The development of a case-related match game to teach physical therapy (PT) students about patient/client focused examination and interventional relationships is at the very heart of the design of Physical Therapy Case Concentration. Based in part on the successful, long-running (1958-1991) NBC game show, Physical Therapy Case Concentration features a computerized board consisting of 30 trilons (3 sided rotating boxes) with numbers, physical therapy related case content, and rebus text/graphics. The rebus is intended to convey a relevant lesson to the student that corresponds to the unique features of the selected PT patient/client case. 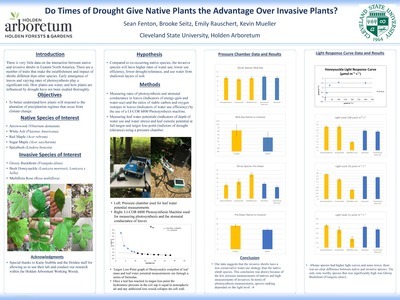 The Undergraduate Summer Research Award (USRA) was used to initiate the development of the coding component of this endeavor. Coding in C# with Unity was employed to create a user interface and subsequent scripting of smaller game elements. The Game Manager scripting is currently underway. With completion of the script, the first clinical case sample content will be added and beta testing will commence. Following a mastectomy, breast reconstruction can be performed immediately with one possible procedure being the use of the body’s own tissue. Natural tissue breast reconstruction surgery can result in abdominal wound complications. 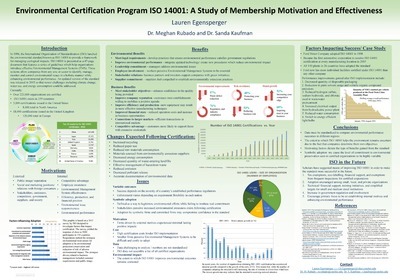 My research focus is on Retrospective Chart Review of patient’s pre- op risk factors for abdominal wound complications post- surgery; including factors such as diabetes, smoking, prior C-section, etc. 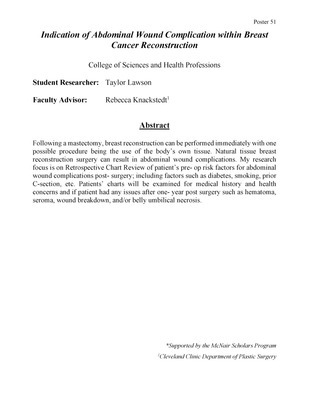 Patients’ charts will be examined for medical history and health concerns and if patient had any issues after one- year post surgery such as hematoma, seroma, wound breakdown, and/or belly umbilical necrosis.